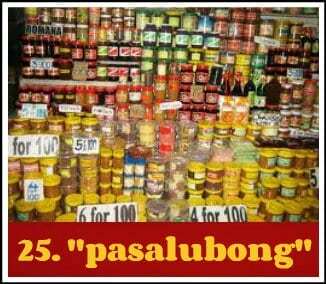 We Pinoys are not only creative, descriptive and sappy, we’re constantly adding words to the world’s lexicon. Google says our language is tough to translate, but one website says it’s among the easiest to learn. While they’re trying to make up their minds, these 30 Filipino words have yet to find their direct word correspondence in English. And for the final installment, we give you these bizarre but often funny and endearing words that speak tons about our culture and beliefs. This word has been debated upon by the inquisitive, the purists and the helpful. But pang-ilan has remained elusive, always needing to be translated in the context of the sentence it came in. 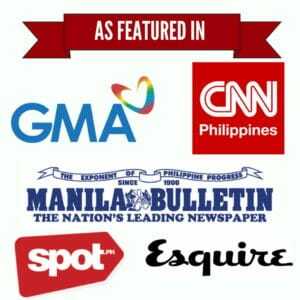 The question “Pang-ilang presidente ng Pilipinas si Erap?” has been exhausted, exploited and worked around, but no one could translate it word-for-word without making it sound awkward and unnatural. Ah, pang-ilan. You shall remain a favorite topic for discussion and banter among barkadas of every age and size. It’s one of those things we’d rather keep private. And rightly so. As Pinoys we’re prissy about bathing and scrubbing ourselves pink so we have a natural aversion to libag. Its’ pretty serious business: scrubbing off these skin dirt is a must according to our nanays, and no decent Pinoy bathroom is deemed good enough without a panghilod. In fact, we’re so obsessed about removing these things that we’ve given names to libag on various body parts just to differentiate them from one another. Yes, we’re suckers for specifics that way. Sumbat happens when someone you’re indebted to chides you about the favors he/she has done for you. 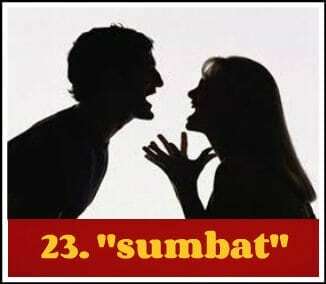 Often said in an angry, reproachful manner, sumbat has hints of regret about the favors given. Our teledramas are replete with sumbatan, and when that couple next door fights, it’s sumbatan festival until they stop. Sure, ngilo is teeth sensitivity. But ngilo is really more about the sensation: that lightning-like, searing, excruciating, palpable pain that your teeth gets when you bite into your ice cream. This old Filipino tradition of bringing gifts every homecoming is expected of balikbayan loved ones and friends. Those who travel overseas, even those who travel to another city even within the country are somewhat expected to bring gifts home, no matter how small, as “souvenirs”. In a country where rice is the staple food, of course we needed a word to describe that brown to golden (sometimes burnt) crusty rice that sticks to the bottom of our rice pot when we overcook our kanin. 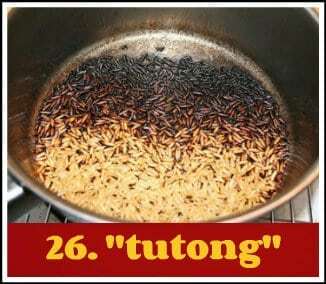 Some Pinoys like the crunchy texture and burnt taste of kaning tutong and would even go as far as to intentionally toast the rice and write a recipe on how to make tutong na kanin. 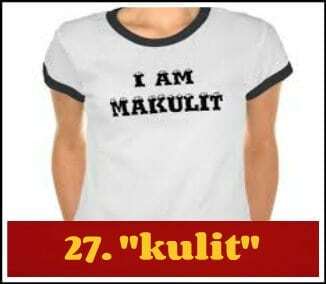 Some would argue that kulit actually translates to pesky. Quite, but not quite. You see, pesky (negative) is annoying. But kulit is not only used in the negative “Tigilan mo ‘ko sa pangungulit mo!”, there’s also hint of positive playfulness about it especially in this context: “Kinukulit ako ng anak ko kung kelan daw ako uuwi”. It is also used to fondly describe somebody who is funny “Ang kulit talaga ni Ryzza Mae, natawa ako sa jokes nya!”. Kulit may also be used to describe something that’s unique, new or cool “Grabe ang tugtog na ‘to, ang kulit!”. Ngalay is the numbness that one feels when you’re motionless and in the same position for a time. 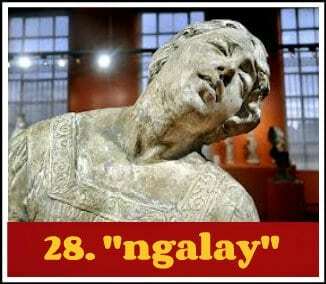 The closest translation for ngalay is numb, although that lacks in definition for what ngalay really means. Ngalay could also happen after strenuous physical activity like carrying or doing something heavy after an extended period. It’s that fatigued, dull ache on your muscles that numbs over time. A sigurista is somebody who makes sure that everything goes according to plan. It doesn’t exactly translate to being a perfectionist. Perfectionists are more on the meticulous side of things, ensuring that everything is done to the letter. 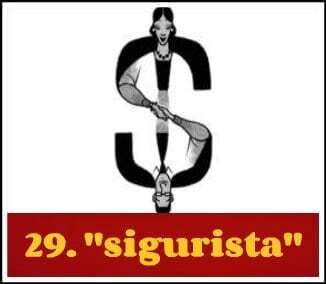 A sigurista is somebody who will not do something unless the outcome is what he/she exactly desires. There’s a very gangster ring to the word that’s somehow reminiscent of old tagalog action flicks and politicians running for public office. Tread carefully now. 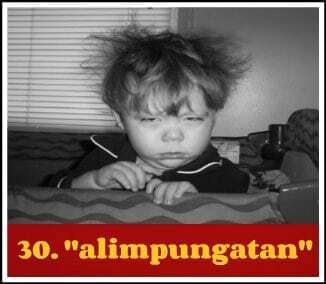 The word in subject is something that all Pinoys know could either make or break a person’s mood. The closest English translation to the word is “rude awakening”, but it doesn’t describe the stupor, or the state of consciousness. Diskarte = Strategy or Technique. How about malansa? They say its fishy but chicken can be malansa but heck they’re not fishy! isn’t the word ‘kulit’ equivalent to ‘cheeky’? “ngalay” -> “numbness”; “ache that numbs over time” — e di “numbness” nga.